Of course, there are some big differences – chief among them that CSR assumes a strategic approach that tightly couples giving with a company’s mission, and in most cases, requires tangible Return on Investment. Whatever you call it, interest is high, as evidenced by the packed ballroom at the DC Hilton, where I joined Renny Purdue of The United Way of the National Capital Area and Alex Orfinger, publisher of The Washington Business Journal, for a discussion billed as “Corporate Social Responsibiity: Fortune 500 Company Best Practices for Small Business." 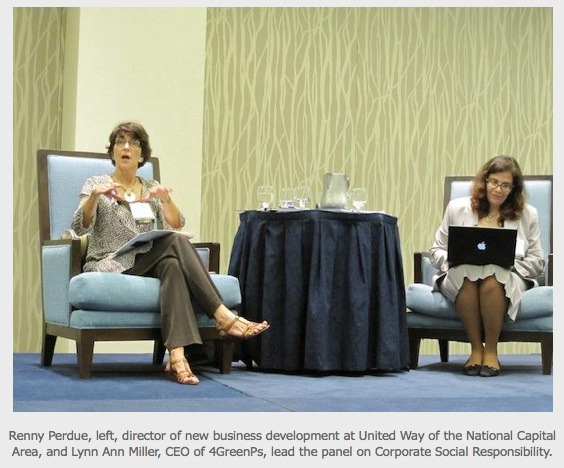 Here are some highlights from the conversation, starting with three tips for companies planning their 2012 CSR initiatives. 1. CSR works best when it is closely aligned with your company’s mission. As a CEO, you may want to think back to why you started your business. What drove you? What are your passions? How can you tie them into your community’s needs? Pinpoint a cause – or causes - that are meaningful to you, your customers, your community and your employees. 2. Be clear about what your goals are, and track the results tied to those goals, just as you would with any other business program. This is not to say that you need an RoI on your program investment per se, but you do want to be sure that you are meeting your goals – whatever they are. Are you sure your program will be welcomed by your community? Is another group (or groups) doing something similar? Could you join forces, rather than risk program overlap or redundancies? Are there opportunities to partner with your key suppliers, partners, and/or customers? How do your employees feel about the program? Can you count on them to participate? How will you respond if you run into unanticipated roadblocks that prevent you from reaching your goals? Have you defined a starting point and ending point for your initiative? We had a fascinating conversation, and I hope to share more of it in future blog posts…. What do you think about CSR for small business? Leave a comment and share!